Hi friends! There’s this feeling that comes when you’ve finally finished a renovation, when you can step back and observe all you’ve accomplished. 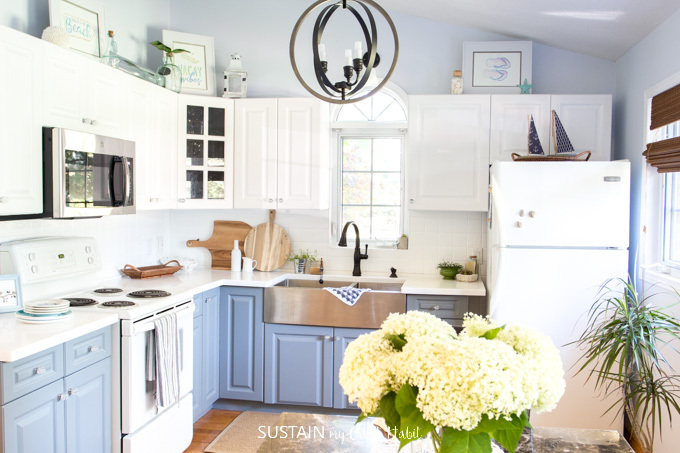 We can happily say that we’ve reached that point with our coastal cottage kitchen renovation. It’s been a loooong journey. While we’ve just only finished the space in the last few weeks, the renovations started at the beginning of April. 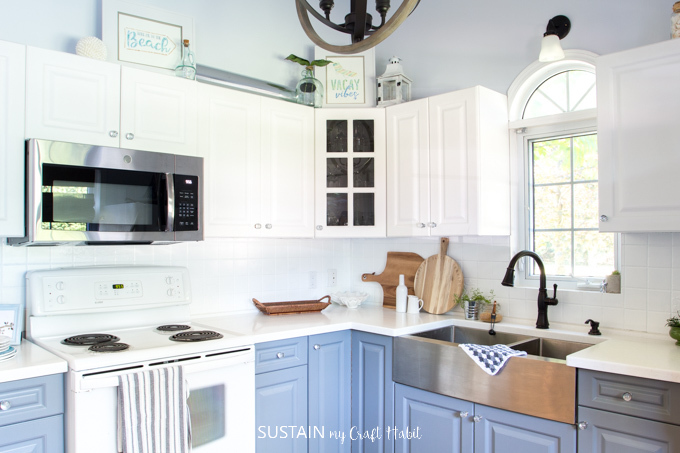 Although in truth, we’ve been talking about the kitchen makeover ever since we first started renovating the coastal cottage bedrooms over a year ago. Since this cottage is at least two hours from where we live, the distance definitely played a part in the amount of time it took to complete. Having only the weekends to tackle the big projects, made us feel like the ultimate weekend warriors! We are very lucky to have worked with some amazing sponsors for this remodel. A BIG THANK YOU to the sponsors Delta Faucet Canada, Build.com, Decoart, PARA Paints and Stencil Revolution. 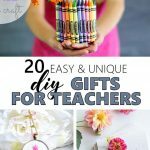 While we were provided the products mentioned in this blog post at no cost, all our opinions are our own. Thank you also to our husbands and parents for helping with the renovations. If there is such a thing as the DIY gene, then our family has it. The first and last time our kitchen was remodeled was almost 20 years ago when it was just built. Our parents made very smart choices and the kitchen has held up quite well over the years. But 20 years is a long time and it was starting to show. 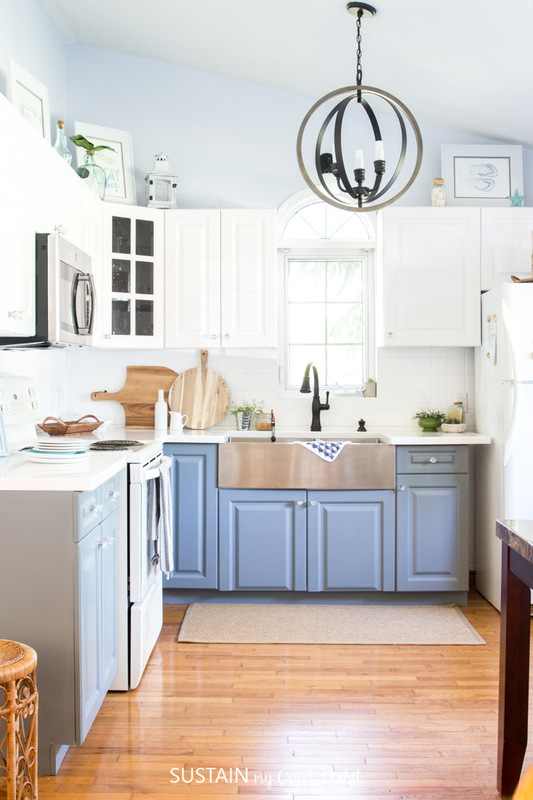 As we all know, a kitchen renovation can be beyond pricey. To keep costs down, we chose to do the work ourselves. Don’t get me wrong, it was a lot of work but in the end, the savings are well worth it. 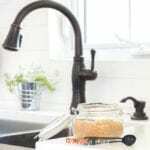 We called in reinforcements when needed, such as to install venting for the exhaust fan for the over the stove microwave, as well as for installing the new counter tops and calling in a plumber to connect the new faucet. To create this coastal inspired look we repainted the existing cabinets, installed a new apron front sink and faucet, replaced the counter tops, changed the door knobs, painted the walls, painted the existing tiled backsplash, replaced the light fixtures, installed an over the stove microwave freeing up much needed counter space, and completed many other DIY projects to accessorize the space. Whew! I think we got pretty close to our original coastal kitchen design ideas. We’re happy to share this video tour with you. Continue scrolling for the photo version! To begin, we painted the walls a beautiful, calming Effervescence color by PARA Paints. 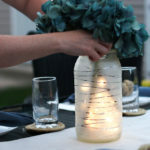 This made a drastic difference in setting the mood for the makeover and really helping to unify the space. The coastal bedrooms were previously painted a similar light and airy color. 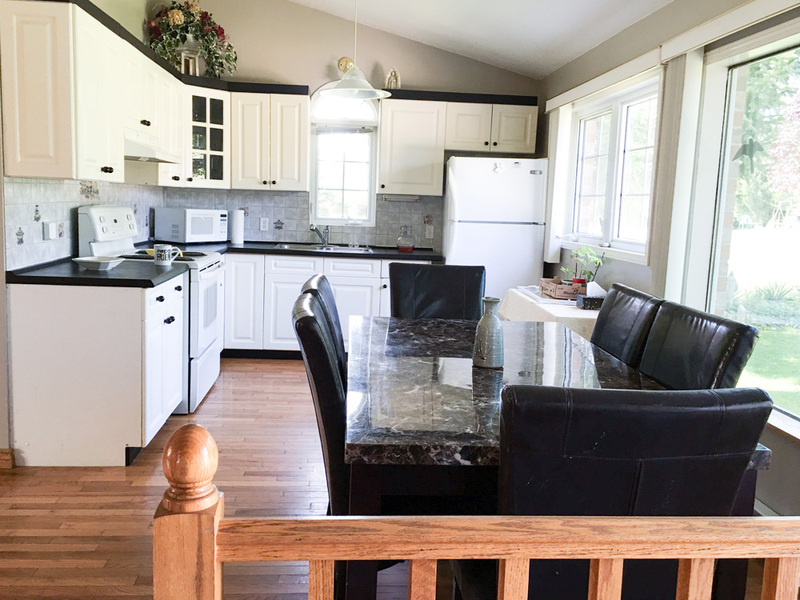 Next we painted over the existing laminate kitchen cabinets using Americana Decor Satin Enamel paint in Pure White for the uppers and Smoke Grey for the lowers. Repainting the existing cupboards and drawers saved us a lot of money. It was time consuming, it’s true, but well worth the effort in the end. The look is completely different, updated and fresh! 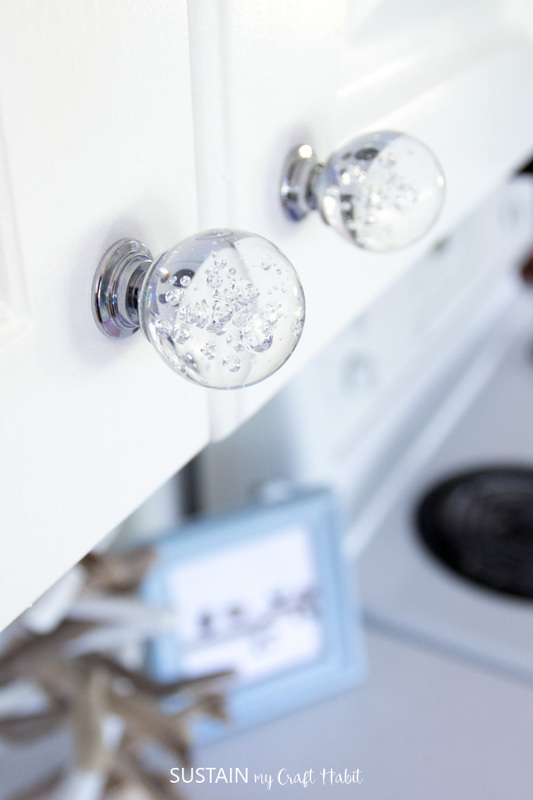 We replaced the outdated knobs with new bubbly glass ones off of Amazon. 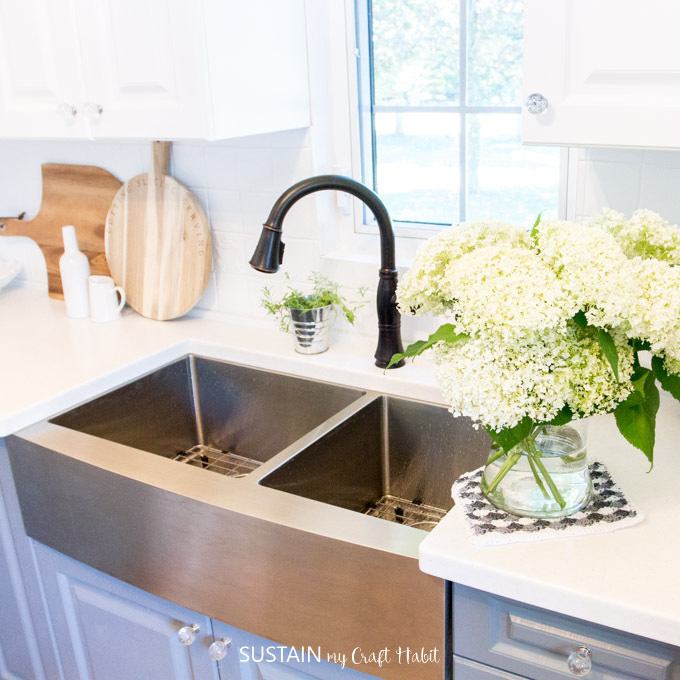 We installed a new oversized Miseno farmhouse style apron front sink from Build.com. Since we don’t have a dishwasher in this kitchen, a large functional sink was a must. I don’t expect we’ll mind doing dishes in this impressive sink. 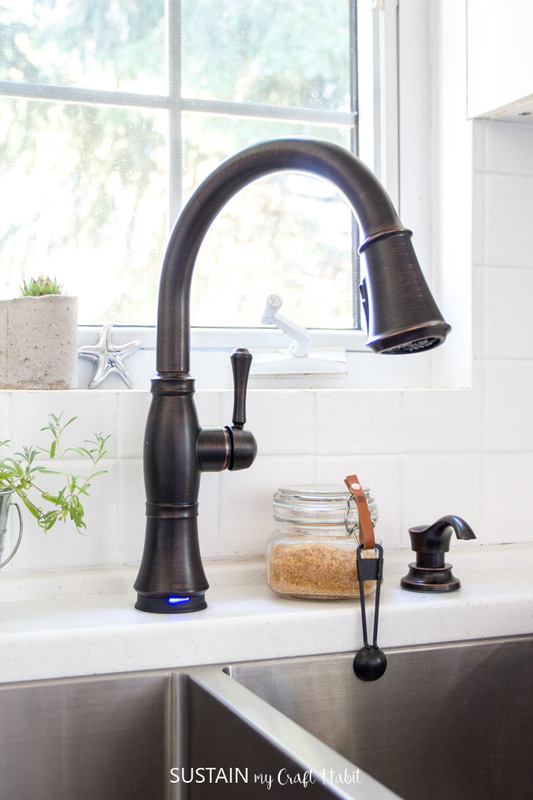 We replaced the faucet with this gorgeous single handle pull down faucet in Venetian Bronze with Touch2O technology from Delta Faucet Canada. 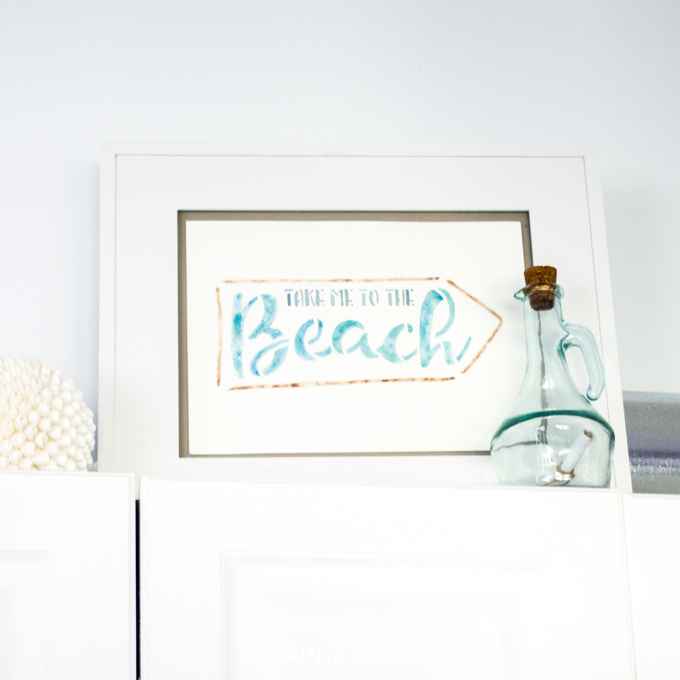 We’ve installed faucets from Delta Faucet Canada in our beach themed bathroom and absolutely love them. 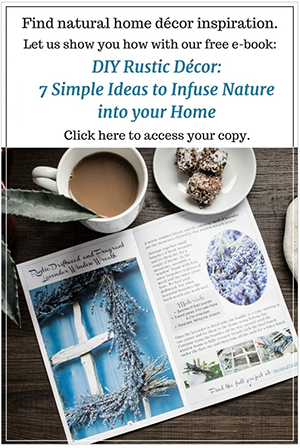 We also have a tutorial for this simple DIY lavender sugar scrub recipe. 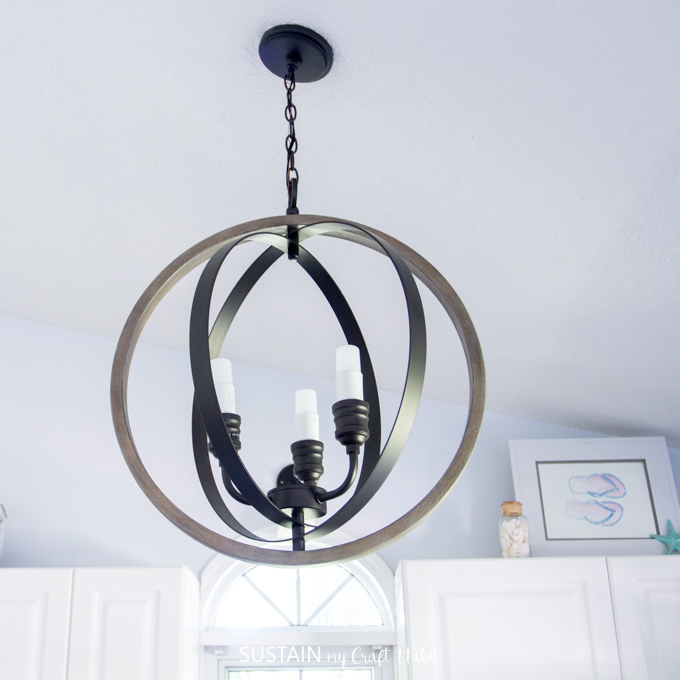 The old light fixture needed to be replaced and we selected this stunning Progress Lighting globe pendant from Build.com, which is one of the main focal points in the room. We managed to reclaim much-needed counter space and achieve better ventilation by installing a sleek, stainless steel GE Over-the-Range Microwave (provided to us at a discount from Build.com). 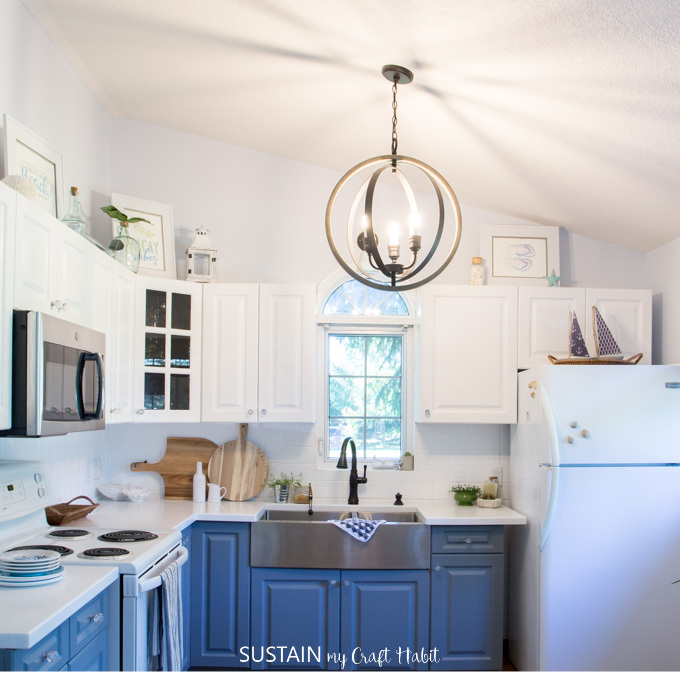 The existing tiled back splash didn’t work with the coastal feel we were going for: the decals were of fruits and the grey was the wrong shade. But removing the tiles and re-tiling was more than we wanted to do at this point. Painting it was the best option for us and you can learn how to paint tile back splash yourself here. 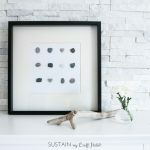 We accessorized the space with some other DIY projects, including these beautiful watercolor art pieces created using stencils from Stencil Revolution. 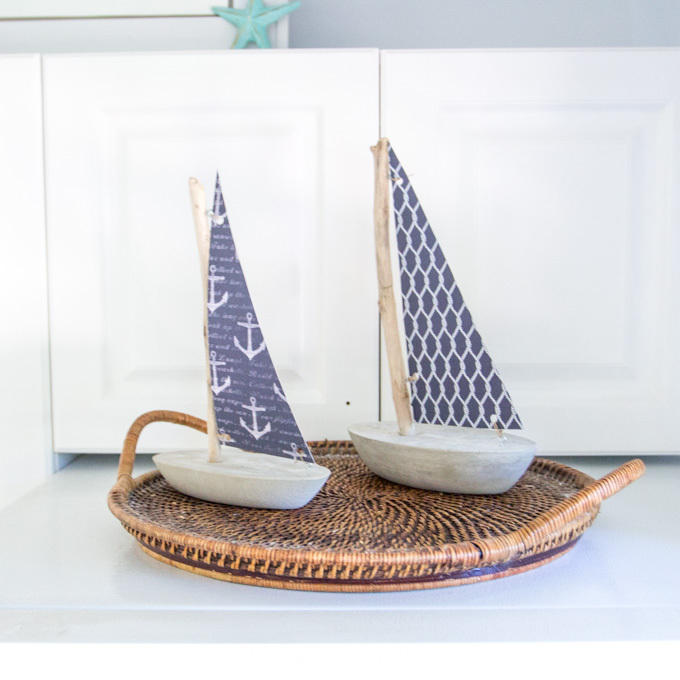 Not to mention our other DIYs like this concrete and driftwood sailboat that work perfectly in the space. We opted not to replace the stove and fridge at this time but look forward to adding coordinating stainless steel appliances in the future. We also plan to refinish the hardwood floors by sanding and re-staining them over the next year. 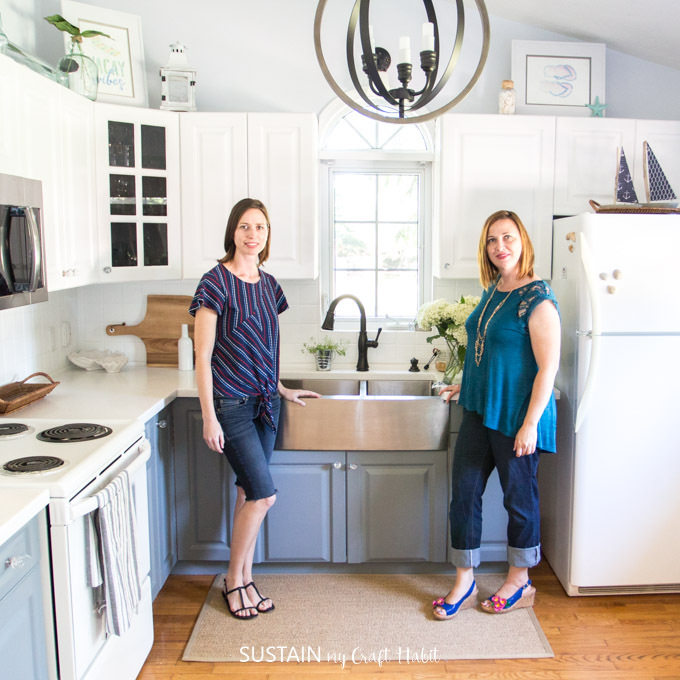 That’s our new coastal cottage kitchen makeover in a nutshell! We are beyond happy with the completed renovation! 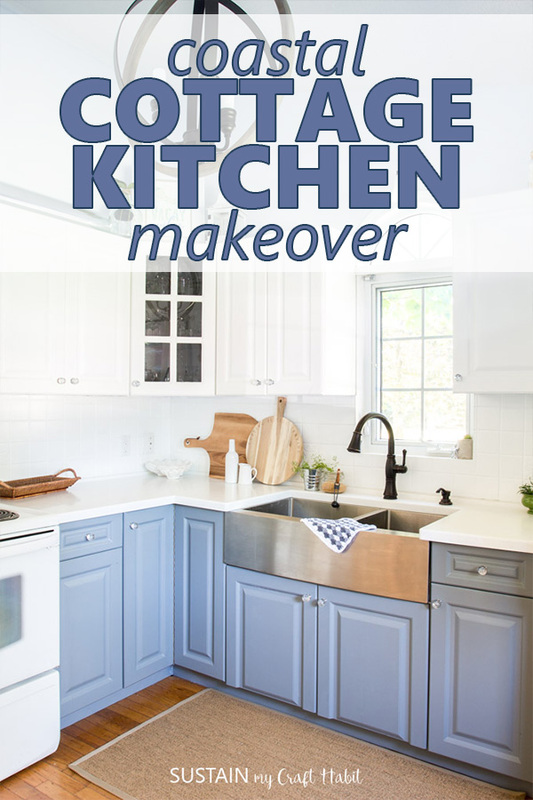 Have you ever tackled a kitchen renovation or are you considering it? We’d love to hear from you. Wow! 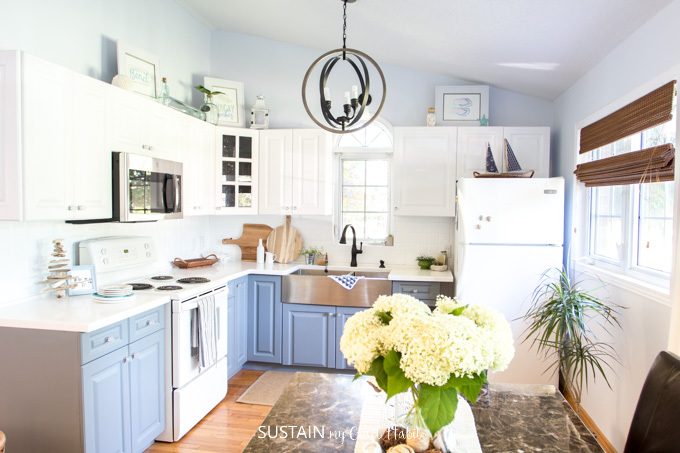 The kitchen really brightened up a lot! 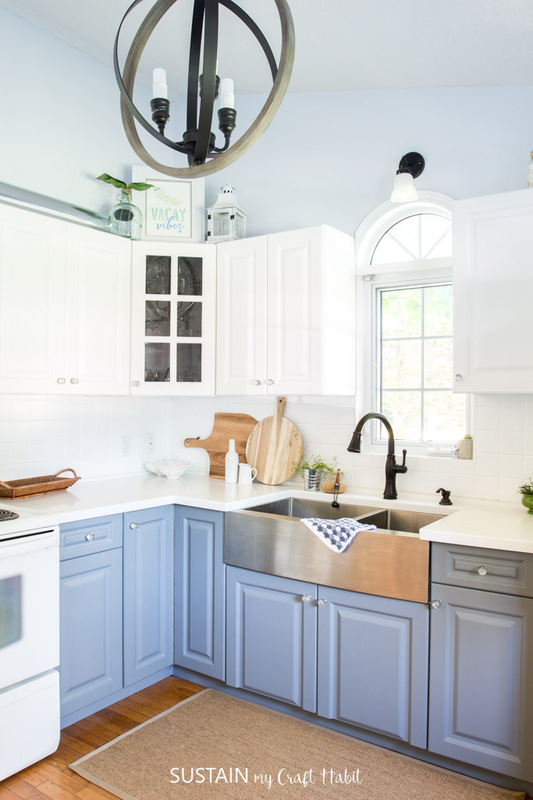 I really am loving that blue you used on the cabinets under the sink. Beautiful kitchen!